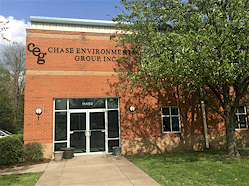 Chase Environmental Group was contracted for the investigation and remediation of Soil and Groundwater at a dry cleaning facility. A groundwater assessment identified extensive subsurface Tetrachloroethylene (PCE) contamination in an area immediately adjacent to the dry cleaning areas. The VAMPIRE™ was used to remove the high concentrations of PCE prior to the injection of Hydrogen Releasing Compound Three 8-hour VAMPIRE™ events were performed resulting in the removal of 27 lbs of chlorinated compounds, which was captured on activated carbon and recycled. After the VAMPIRE event, (HRC) injection was used to complete the degradation of the chlorinated compounds to acceptable levels. 1200 lbs of SDS (Terra Systems hydrogen releasing compound) were injected into 25 locations in the area of the plume.